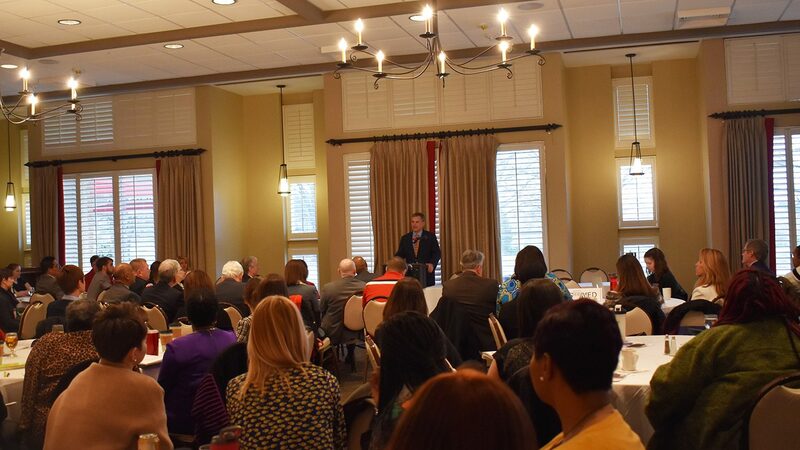 More than 200 educators and social workers attended the Strengthening Families, Communities and the Schools That Serve Them: An Interdisciplinary Summit on Tuesday, March 27, 2018, at the NC State University Club. Hosted by NC State’s Department of Social Work and College of Education, the summit invited thought leaders and experts in education and social work to lead the discussion on issues like poverty, inclusion and the role of families in education. After his address, there were breakout sessions featuring representatives from NC State, universities across the state, the N.C. State Board of Education, the Wake County Board of Commissions and the Wake County Board of Education, among other organizations. Those breakout sessions included disAbilities: Building Strength Through Inclusion, Strengthening Our Society Through Schools, and Serving Students’ Needs Through Interdisciplinary Collaboration, they provided a space for dialogue between panelists and summit participants, as well as between social workers and teachers. “Often when we talk about Latino students and families, we start the conversation by talking about their deficits and limitations. So, our first step in supporting them is to identify their strengths and assets first.” — Iliana Santillán-Carrillo, Community Organizer, El Pueblo, Inc.